The 12th Annual Sunflowers for Wishes at Buttonwood Farm in Griswold will be in full bloom from July 18th through July 26th. More than 450,000 sunflowers are expected to bloom on fifteen acres of farm land yielding sunflower bouquets that will be sold to benefit Make-A-Wish Connecticut. Also returning to the farm this year will be the Buttonwood Farm hayrides through the sunflowers, bringing joy and happiness to everyone who visits. Duane Button and his family donate one hundred percent of the proceeds to Make-A-Wish® Connecticut, to create wishes for local children battling life-threatening medical conditions. Sunflower-themed t-shirts and notecards will also be offered to help support Make-A-Wish. And don’t forget to purchase one of Buttonwood’s own famous sunflower ice cream cones, made right there on the farm! 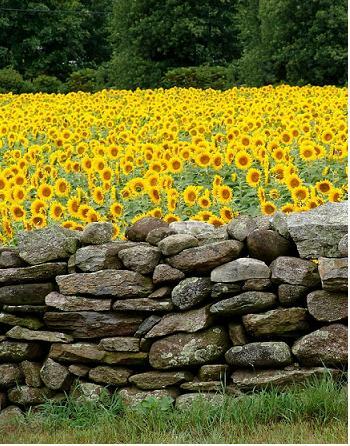 For more information on “Sunflowers for Wishes,” please call (860) 376-4081 or visit www.sunflowersforwishes.com. To volunteer at Sunflowers for Wishes, contact Nicole Miles, Volunteer Coordinator, at nicole@ct.wish.org. We will see you at the farm!